Personal budgeting is a crucial part of your military readiness and peace of mind, for both single service members and military families. Budgeting planning with your spouse prior to your deployment will help ease the stress on both of you. Making personal budgeting a habit is vital in helping you make the most of your military pay and will start you on the road to financial freedom. For many people, their idea of a budget is looking at their checking account to see if they still have money left. If they do, then they feel they are within their budget! That may keep them from overspending, but such a lack of money awareness will not get them on the road to the goals of financial freedom and creating wealth. A single guy or gal can sometimes get away with winging their monthly expenses on a short-term basis. But once you become a couple or a family, there is no hiding from the necessity for financial budgeting planning. When you have to pay a mortgage/rent, car payments, braces, sports fees and equipment, ballet lessons, band instruments, cheerleader camp AND you want to invest for college education and eventually retirement, just looking at your checking account won’t cut it. 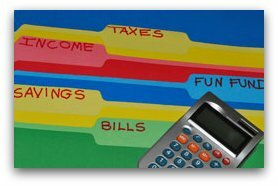 Both spouses have to understand the importance of budgeting, and agree on a budgeting program for the family. No matter how much planning and budgeting is done, unless both spouses support the idea of financial budgeting, the plan cannot work. Military Budgeting 101 - What is Budgeting? Many military families and younger military members just starting out, both officer and enlisted, often find it hard to make ends meet. That's why it's so important for you to learn about budgeting money. We don't do a very good job of teaching money matters in our school systems. So unless you learned the concept of budgeting from your parents, you may be asking, "What is budgeting?" The definition of budgeting may vary, depending on your purposes, and whether you are engaging in personal budgeting or business budgeting. The word "budget" comes from the French word "bougette" or "purse," and generally refers to a list of all expected income and expenses. Basically, it is a plan for saving and spending. One of the best ways to begin the process of creating a budget is to keep detailed records of your spending for an entire month. Why does Personal Budgeting Matter? At its most basic, a personal budget is THE way to make sure you don't spend more than you make. Spending more than you make is the major reason for the large amount of debt many families and individuals carry. A recent study found that most Americans spend 120% of their income, regardless of salary level. It doesn't take a rocket scientist to figure out that if you make $100 and spend $120, you're going to be in big trouble in a big hurry. Some debt, especially credit card debt, sort of creeps up on you. All of a sudden you discover you owe more than you realized and you really can't remember what you spent it on. Using a budget is one way to help prevent this problem and will help you spend less. Personal budgeting is a great tool for you to plan your spending and better yet, to find money for saving and investing – so you can "pay yourself first." Almost every money expert you find will tell you that paying yourself first is a major step towards financial freedom. With a budget, you can more easily identify bad spending habits, poor money decisions or just poor financial planning. The numbers don't lie, so when you add up everything and the result is in negative territory, you've got nowhere to hide (which might be why some people avoid doing it)! It helps you keep your credit card spending under control. Treat your credit card like a debit card and pay off the full balance every month. By budgeting every week, you can keep yourself from using a credit card when you really don't have the money to pay for your purchase. Contrary to popular belief, a budget can actually give you more freedom by allowing you to make purchases when you know for a fact you have the money for it! Having a budget will make you more aware of your money, which is one of the first steps to creating a secure financial future. No one ever became wealthy by not being aware of their money (except those few lucky lottery winners). Once you have developed your budget, you will be able to analyze every potential purchase to determine whether the purchase supports your goals of debt-free living and financial freedom, or if it just means it will take you that much longer to reach them. For deployed service members, setting up a budget system before you leave will give you peace of mind and allow you to focus on your mission, knowing that your family back home has enough money to cover the bills. That gives you one less thing to worry about. Credit Cards can be a double-edged sword. If you have problems using credit cards responsibly, stick to cash and debit cards. Buy things on a credit card ONLY if you know you will pay it off when the bill comes. I highly recommend you have only one credit card, which you should make sure you pay off every month. The bottom line is that personal budgeting, regardless of your income level, is crucial if you want to ensure that you are keeping more and more of what you make. In turn, the more you keep, the more wealth you can build. Military families can get free budgeting help at a variety of on-base and online services, including Air Force Aid Society, Army Emergency Relief, Coast Guard Mutual Assistance, and the Navy-Marine Corps Relief Society. We'd like to thank our guest author, former Air Force Space and Missile Operations officer Luis Amato, webmaster at Wealth-Steps.com, for the inspiration for this article, as well as the majority of its content. If you're one of the fortunate few who has already gotten your family out of debt, and you're ready to begin building wealth for your future, be sure to check out Wealth-Steps.com. If you're just starting on the journey to a debt-free life, the first step in personal budget planning is to properly prepare for creating a budget. Once you've done the preparation, then check out our tips on budgeting. Return to top of Personal Budgeting.